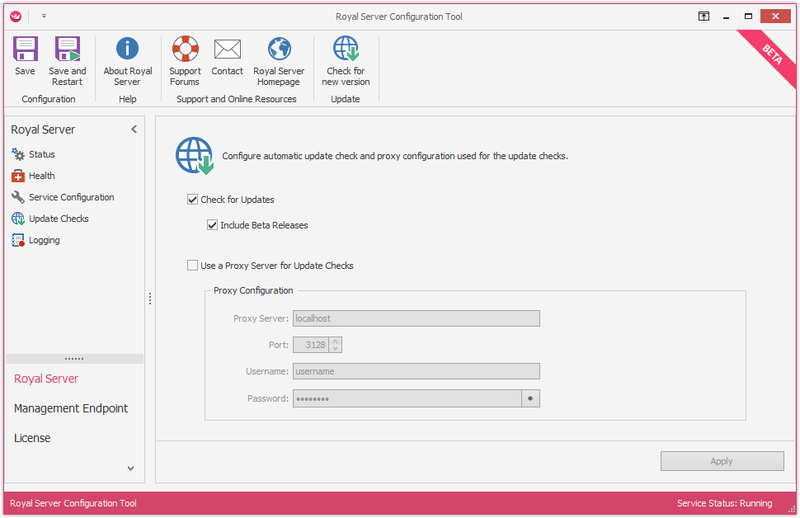 After you have installed Royal Server, you should check Configure Royal Server now to review the default installation settings and adapt them to your needs. Although this post seems a bit long, you can leave everything default – except the Worker Account. Attention: Make sure you configure the Worker Account, otherwise Royal Server is not able to connect to remote machines! 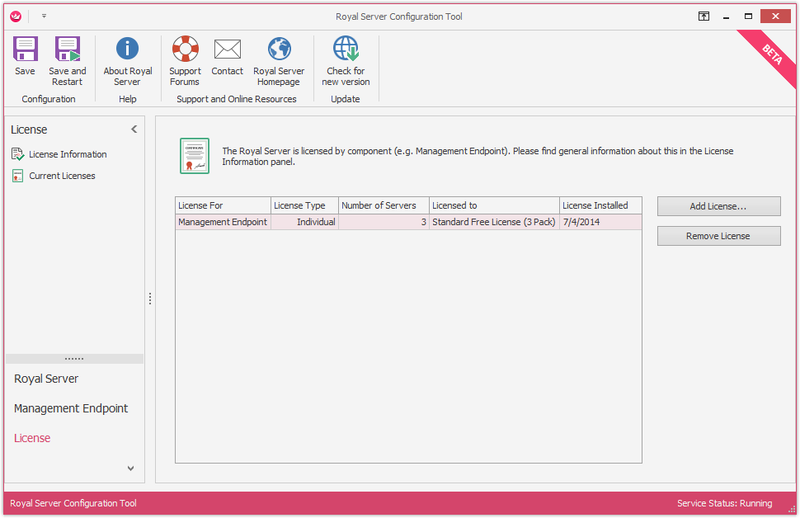 The Royal Server Configuration Tool enables you to check the status and health of Royal Server. You can configure installed components and manage your licenses with it. 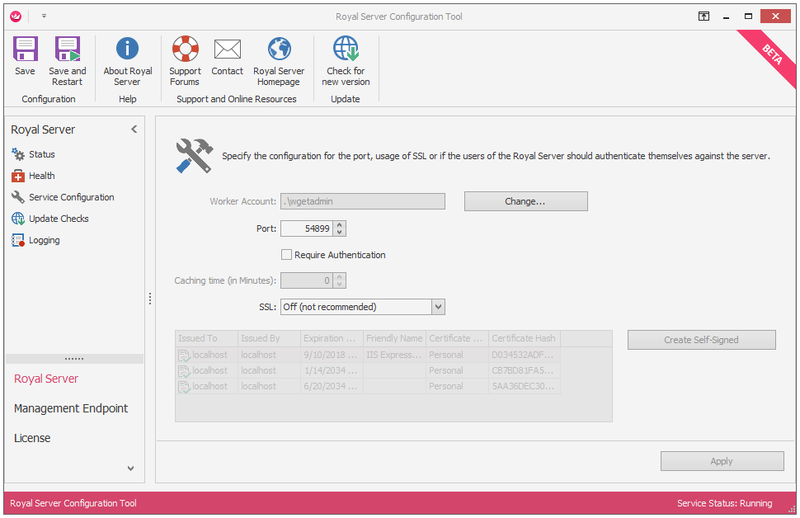 After the Royal ServerConfiguration Tool has been launched, it is strongly recommended to set a Worker Account. Royal Server is running as a Windows Service and as such is using the Local System account. But for the commands Royal Server is executing, a Worker Account is used. It is vital, that this account has network access rights, otherwise Royal Server is unable to manage your servers. If you want to restrict access to Royal Server, you can check “Require Authentication”. If checked, Royal Server only accepts requests from users who are members of the local group “Royal Server Users” (which will be created automatically). By default, the setup puts the local Administrator in this group. In addition, you need to setup and assign this credential in the Royal TS/X Management Endpoint. 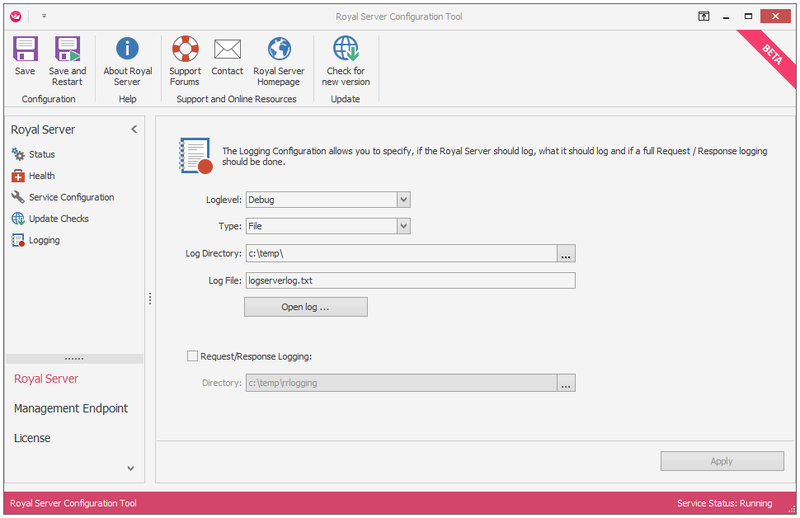 To improve performance when authentication is required, configure the Royal Server caching time (default is 5 minutes). By default, Royal Server logs all Errors to the Windows Event log. A special log with the name “Royal Server Log” has been created automatically. Additionally you can enable Request/Response logging where full requests and responses are logged. For each request, two files will be generated: a <guid>_request.xml and a <guid>_response.xml. Attention: This setting is producing a huge number of files and it is generally recommended to only turn it on for debugging purposes. Remark: Since we don’t expect you to have the Royal Server Configuration Tool open all the time, this update check is also included in Royal TS/X. This way you also get notified if there is a newer version of Royal Server available. Royal Server is designed to be very extensible – because we have big plans for further features. 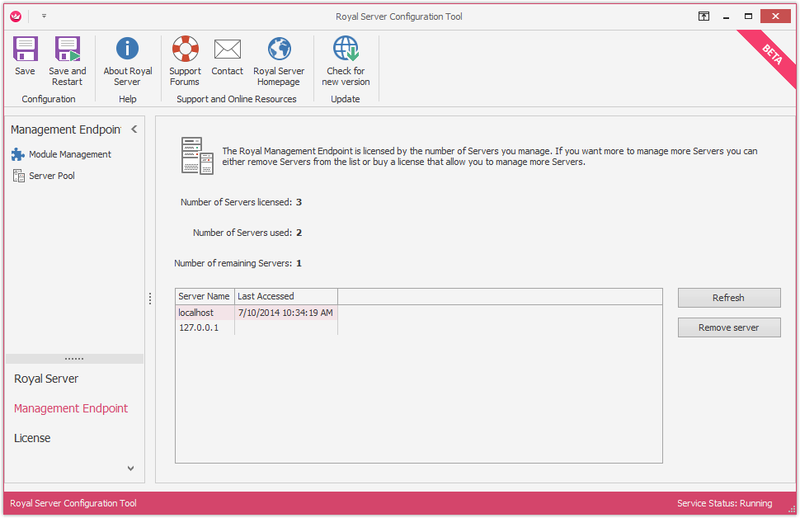 Royal Server offers functionality through components – so far, there is only one component: the “Management Endpoint”. A managed server is computer or device represented by its hostname or IP address. It does not matter what operating system the device is running (server or client operating system, network device, etc.). It does not matter, if it is virtualised or not. It does not matter how many CPUs/cores the device has. Royal Server is keeping track of the servers you manage. In the Server Pool configuration, you can delete previously managed servers to free up licenses. This panel shows the number of managed servers you have licensed, how many are used already and how many free licenses are available. 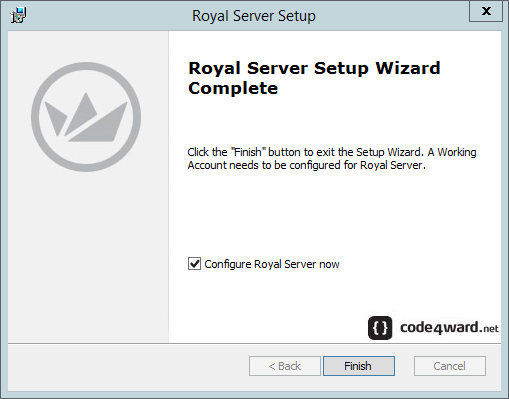 The column “Last Accessed” shows the last timestamp Royal Server accessed this server (this information is stored in memory and is not immediately available after the service was started). Most of the Management Endpoint modules are based on WMI. To enable the proper configuration for remote WMI calls, you need to execute the Enable-PSRemoting command in an elevated PowerShell console. In case the Windows Firewall is enabled the following two rules must be enabled: “Windows Management Instrumentation (WMI-In)” and “Windows Management Instrumentation (DCOM-In)”. For the above two steps, we have also prepared a PowerShell script (in <royal-server-installation-dir>/scripts/prepare_server.ps1). Last but not least, you need to make sure you specify proper credentials when you configure a management connection (such as Windows Events or Windows Services) in Royal TS/X. In most scenarios, a user account who is member of the local administrators group is used. For low privilege environments a number of steps are necessary to grant non-administrative users the required rights.